Iron Banner is live this week in Destiny 2, and Xur has fittingly brought one of the game's most powerful and annoying Power weapons for sale this weekend. You probably want to pick this up if you don't have it, because you've most likely been killed by it and wondered how the heck it happened. 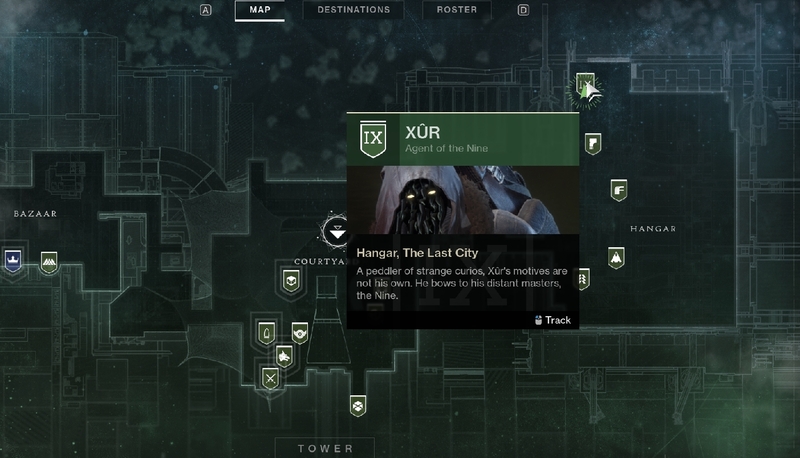 Xur is in the Hangar of the Tower, since this week's Flashpoint is on a DLC location in Mars. He's standing on a balcony behind Arach Jalaal of Dead Orbit. This week's weapon is The Colony, a grenade launcher. But it doesn't really launch grenades at all. The Colony's payload is miniature spider robots that will seek out and chase enemies before exploding on them. This weapon is very fun to troll with in PvP, and it only costs 29 Legendary Shards. This week's Warlock armor is Skull of Dire Ahamkara. It's an Exotic helmet that provides additional damage resistance during Nova Bomb, and Nova Bomb kills will grant additional Super energy. It cost 23 Legendary Shards. 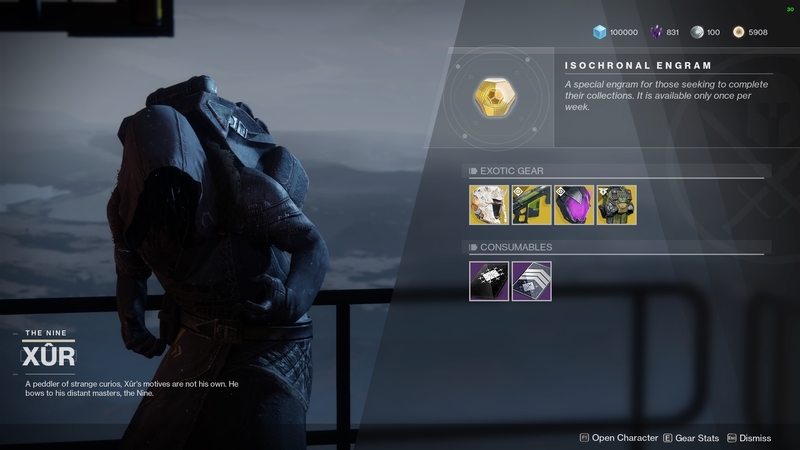 For Hunters, Xur has brought Graviton Forfeit. This is another helmet that increases the duration of any invisibility effects, and allows melee to recharge faster while invisible. It's on sale for 23 Legendary Shards. This week, Titans get to buy Armamentarium, an excellent chest piece. This armor gives you an additional grenade charge, so you can throw two grenades when fully charged. This armor works very well in PvP and with specific grenades, so make sure to pick it up.